The decision of whether to name or not name ospreys is a controversial subject, some people are all for it and some people absolutely hate it. For many people however, they find it easier to relate to the birds if they are given a name. They can connect to them better and it prevents confusion when we are talking about past years and other male ospreys. Whilst 11(98) was still with us it was easy, he had a ring that we could identify him by when we were talking in our facebook posts and other blogs. Recently we have found ourselves calling the female Mrs G, just as many of our followers already do, and we have decided to adopt this name officially for her. 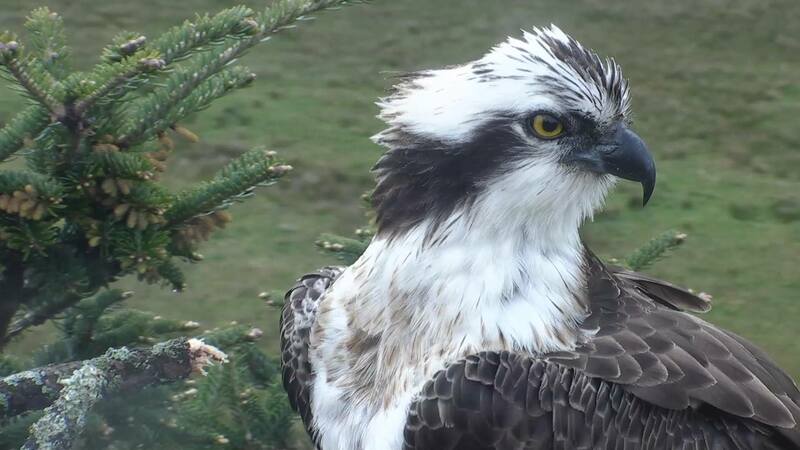 We felt that as the new male was unringed he should also be given a name. After careful consideration we decided it would be good to name him after one of the local mountains of Eryri, as he can frequently be seen heading off in that direction when he goes out on a fishing trip. He will be known as “Aran” after Yr Aran. As you can see from the image he is certainly a handsome male. This morning our pair had a visitor to the nest in the form of an intruding osprey. It was a very persistent bird and remained around the nest for two hours. Several times it dive-bombed the nest, but the resident pair foiled each of its attempts to land. We were not able to spot whether it was ringed, but felt from the behaviour and size it may have been a female. Eventually Mrs G chased the intruder from the area, leaving Aran to incubate the eggs. We did not see it again during the afternoon.